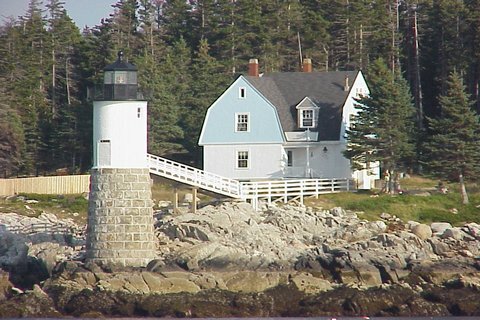 The Isle Au Haut lighthouse, sitting on the western edge of the island of Isle Au Haut on Robinson's Point, was one of the last lighthouse built in Maine, in 1907. In 1934 the light was automated and the house and surround land was purchased by Charles Robinson, a local island resident. In 1986, Jeff and Judi Burke, the current owners, bought the land and surrounding houses. The lighthouse tower is owned by the Town of Isle Au Haut and the light is maintained by the US Coast Guard. Jeff and Judi undertook quite a project when they bought the house and restored it and turned it into a fabulous Inn called the Keeper's House. The meals served at the Keeper's House, most made by Judi, will rival any of the finest gourmet restaurants. The house still has no electricity. Oil lanterns and candles provide light at night (don't worry, they do have running water and hot showers). Jeff Burke wrote a fine book about their adventures in restoring the house and stories about some of the guests and nearby neighbors. The book is called Island Lighthouse Inn: A Chronicle. Be sure to check it out! It's a great book. In 1999 the light tower was completely renovated. Today it looks superb. During our stay at the Keeper's House we were lucky to have the Coast Guard stop by to do maintenance on the light. They were gracious enough to let us climb the small tower. Click the link above (Click for more Photos) to see some pictures inside the tower. Isle Au Haut Lighthouse can only be seen from boat or plane. Lighthouse cruises out of Camden go past this lighthouse. The mailboat from Stonington also makes trips to Isle Au Haut. See our Lighthouse Tours page for more info.